How Do Dolphins Communicate? Can Humans Speak Dolphin? In this guide, we discuss dolphin communication, the plausibility of a dolphin language, and how us humans may one day be able to speak dolphin. As one of the world's smartest animals, dolphins have a complex communication system that they use for survival, fun, and social interaction of all kinds. While scientists are just now beginning to understand the depth of dolphin communication, one thing is clear: these marine mammals know how to talk (even if we can't understand them). In this guide, we discuss dolphin communication, the plausibility of a dolphin language, and how us humans may one day be able to speak dolphin. We also provide resources on our many amazing dolphin tours here in Puerto Vallarta. Read on to learn more, and book with our team here at Vallarta Adventures today! Dolphins communicate using a vast array of sounds and nonverbal gestures. Like humans, dolphins use both verbal utterances and nonverbal gestures to communicate with one another. These include whistles, clicks, and loud broadband packets of sound called burst pulses. Studies conducted by researchers around the world have collected data on wide range of sounds and nonverbal gestures used by dolphins for what many believe to be a complex system of communication. Do dolphins have a language? Dolphins employ a wide range of sounds to communicate with one another. Researchers are still trying to determine whether these sounds constitute a language. Research by scientists shows that dolphins do indeed communicate with each other using a wide range of sounds and gestures. Exactly what these sounds and gestures express, however, remains largely undetermined. Thus, the question of whether dolphins have a language also remains largely unanswered. 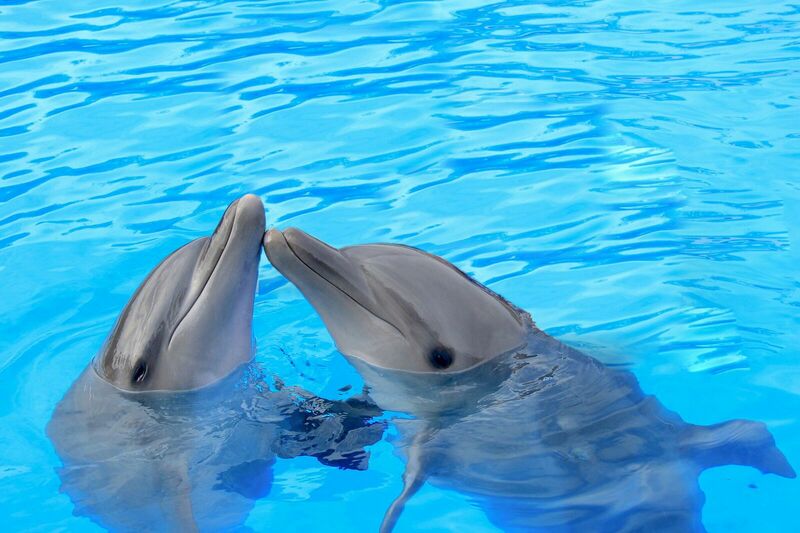 Learn more about the research conducted on dolphin language in the following sections. Dolphin communication: what is the dolphin language? In addition to nonverbal gestures, dolphins use clicks, whistles, and loud pulses to communicate. To date, there has been no confirmation of anything resembling a dolphin language. Though dolphins use a wide range of sounds and nonverbal gestures to communicate, virtually no evidence supports the existence of anything resembling a dolphin language — though scientists are still looking. Some studies are using advanced algorithms to find rhyme and reason behind dolphin noises and gestures. Some scientists are even trying to talk to dolphins themselves. CHAT (cetacean hearing and telemetry), a computer that can broadcast dolphins’ prerecorded signature whistles as well as dolphin-like whistles into the ocean at the push of a button, was developed and is currently being used by the world's leading dolphin scientists in an attempt to communicate with dolphins in the wild. Can dolphins communicate with humans? Dolphins and humans can communicate to a limited degree. Dolphins are capable of learning skills based on human instruction and expressing certain desires. Any dolphin trainer will tell you that dolphins and humans can indeed communicate in a limited in fashion. This "limited fashion" involves learning certain trained tasks and expressing the desire for things such as food. The communication of more nuanced and involved thoughts or commands, however, remains un-cracked. CHAT's communication with dolphins has, to date, yielded little progress on breaking the communicate language barrier between humans and dolphins. How do dolphins communicate with each other? Studies show that dolphins use a wide range of sounds and nonverbal gestures to communicate with each other — though the complexity of their "language" remains a mystery. Dolphins communicate with each other through a wide range of sounds and nonverbal gestures. As sound travels 4.5 – 5 times faster through water than through the air, dolphins rely primarily on noises to communicate with one another. Not only do they whistle and click, but they also emit loud broadband packets of sound called burst pulses to discipline their young and chase away sharks. Scientists believe that every bottlenose dolphin develops a distinctive high-pitched whistle, called a signature whistle. The signature whistle appears to serve as a means of individual identification, much like a name. Research also suggest that certain types of physical contact between dolphins may signify important nonverbal communication. To date, scientists have yet to crack the code of dolphin language, and thus cannot "speak dolphin" — though hope remains. Want to speak dolphin? As many scientists will be quick to tell you, this is easier said than done. When it comes to talking to the world's most intelligent marine mammals, a lot gets lost in translation. Even CHAT, which is capable of broadcasting dolphins’ prerecorded signature whistles and synthetic dolphin-like whistles into the ocean at the push of a button, has not yet received meaningful responses from dolphins in the wild. While many researchers hypothesize that the many sounds and gestures dolphin make are indicators of a sophisticated dolphin language, as of now, us humans cannot speak it. We may not have cracked the code to dolphin language, but that doesn't mean that some communication with dolphins hasn't been achieved. In fact, here at our award-winning Dolphin Center in Nuevo Vallarta, our dolphin trainers have learned a lot from our resident dolphins and developed amazing relationships to last a lifetime. We are proud to offer special, one-of-a-kind tours, including our Dolphin Signature Swim and Dolphin Trainer for a Day tours, where we give you the chance to experience the dolphins at our center just like we do. Learn from our knowledgeable trainers about what goes into caring for dolphins and interact with these amazing marine mammals like never before. If you're looking for a chance to glimpse dolphins in the wild, we recommend booking one of our many cruises and sailing tours offered right here at Puerto Vallarta. Explore our site to learn more, and book with us today! Create unforgettable memories in Cabo by embarking on the adventure of a lifetime with our wide selection of world-class tours! Learn more about us, Subscribe to our newsletter below, or contact us for more infomation! © 2018 Aventuras y Expediciones de los Cabos S.A. de C.V., All Rights Reserved.